A woman has given birth to an embryo frozen 24 years ago. The Washington Post reports that Tina Gibson, a 26-year-old woman living in East Tennessee, knew that she probably wouldn’t be able to give birth naturally because her husband has cystic fibrosis. So she applied to an embryo adoption program in 2016 and received three embryos from an anonymous donor, eventually giving birth on November 25 to a healthy baby named Emma Wren Gibson. Can we just...sit with that for a second? Science is wild! Because of how old her embryo was, the National Embryo Donation Center said that Emma holds the record for “the longest-frozen embryo to come to birth.” But others aren’t so sure that’s correct, because American companies aren’t required to report the age of embryos, just the outcomes. In 2010 a woman gave birth to a baby using a 20-year-old embryo. As more people use IVF to get pregnant, more are also left with unused embryos. For those that don’t want to put them back in storage, destroy them, or donate them for research, adoption is another option. 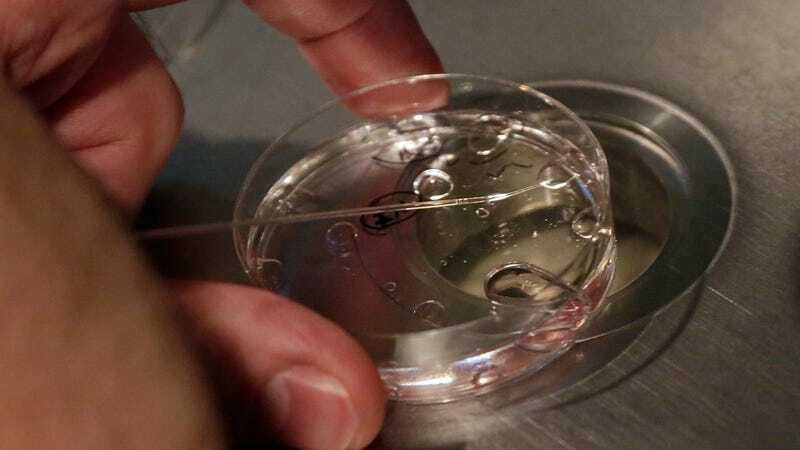 Even though a 2010 survey found that 60 percent of more than 1,000 patients said that they were ‘very unlikely’ to donate their embryos to a couple in need, because embryo adoption is less expensive than IVF the process is beginning to grow more popular.